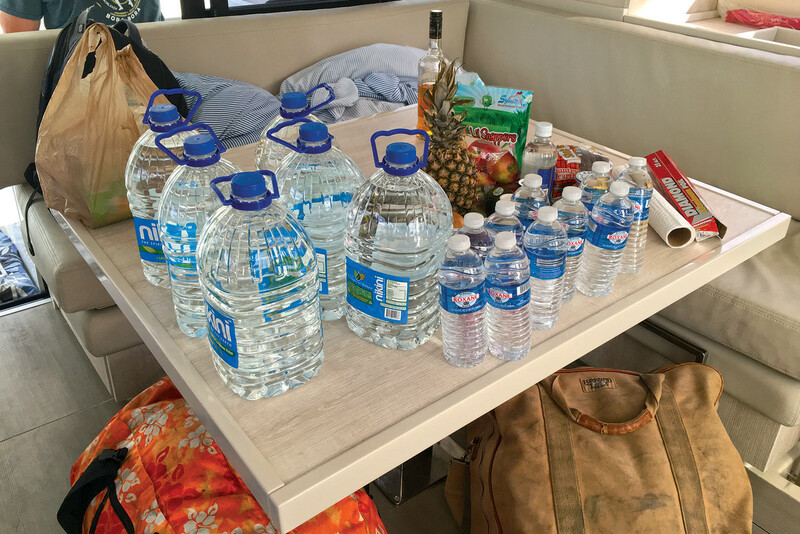 My last day of a recent weeklong charter revealed an expensive lesson: when we gathered up all the leftover provisions, they covered the saloon table. I’m no newbie when it comes to provisioning, but I let this one slip as we were harried on departure day and multiple people shopped. Not only is over-provisioning wasteful, it’s expensive. So here are a few tips (that I know too well, but didn’t employ on said occasion) to help you slide into the finish line with nary a Saltine left. Most bareboat charter companies offer three levels of provisioning: full, partial or none. “None” is risky if the stores are closed when you arrive, and “full” is usually expensive and disappointing. The smartest way to go is a limited partial so you have some food aboard, but aren’t tied to the charter company’s choices, quantities or prices. Most charter companies will provide a list that usually includes staples like pasta, rice and breakfast cereals. Their list will be in English, so you’ll know what you’re getting. Choose basic items that are easily overlooked when you get to the store like matches, dishwashing detergent, condiments, sponges, trash bags, charcoal and salt and pepper. Alcohol, like beer and wine, is usually best left for your shopping adventures, because you’ll probably find better choices and prices on your own. However, you may want to order a case of beer in your partial to get you started. This is a no-brainer, but there are two things to remember: 1) List small items (like seasonings) that you can bring from home and don’t want to buy in large quantities onsite; 2) Divide the list so if you send crew to do the shopping while you do the chart briefing, three people won’t come back with a week’s worth of water. Assign a chief provisioning officer, and if you can’t find one, do it yourself. Meal planning can also be done on the flight down to cut on impulse purchases. On your charter, you may visit islands where you don’t speak the language and won’t recognize the brands. It’s OK. Be adventurous and try the local yogurt, tuna, jam, peanut butter, etc. “Buying American” can also be expensive. French Polynesia, for example, is expensive in general and insisting on U.S. brands will quickly prove self-defeating, especially when there are so many local or French brands that are great. Why provision Budweiser when a delicious local Tahitian Hinano is better at half the price? European brands of meats, cheeses and chocolates are excellent, so forget Hershey’s or Velveeta and treat yourself to something a bit more exotic. You won’t be disappointed and it will cost you less. In parts of the Caribbean, local vendors will come out to your boat every morning with fresh French bread and croissants. Be sure to take advantage of this service. It’s a terrific way to shop and will take care of your breakfast needs. Also, be sure to give yourself ample opportunities to eat out. You won’t be the first sailor tempted by the smell of a cheeseburger in paradise, so allow yourself the chance to be spontaneous. Most likely you’ll be chartering where the weather is hot and your outfits are sparse. That’s a motivator to eat well on vacation. Stock up on fresh local fruit and produce, and skip the potato chips. Find out what is in season and shop local markets that are educational, fun and cheap. Get fresh fish from locals and make cooking part of the fun. You may end up feeling (and looking) much better by the end of your trip. This is the big one that started it all: whatever you think you’ll need, cut it by a third. Shop small and often instead of loading up on a week’s worth of groceries at your departure point. Your provisions will fit better in the small refrigerators inevitably found on most charter boats and your food will stay fresh. Besides, it’s fun to visit multiple markets along the way and discover unexpected treats like Mahi mousse (a fish paté), which makes a great appetizer with sundowners. Finally, you’ll never dial it in exactly, so be sure to share at the end. Ask a full-time cruiser if they’d like your unopened goods and water bottles. Sometimes the charter company staff will be happy to relieve you of your leftovers even if the packages have been opened. Always ask politely, never assume. Sharing will make you feel better about the money you spent on the food you’re leaving behind, and if you do it right, there won’t be much.